In recent times pipe bursting has become an increasingly preferred sewer, water, and gas pipe replacement method for project owners in the Oakland, California area. Decision makers have come to realize that this high-tech process is a less costly, less disruptive, and faster alternative to open cut trenching. Typically speaking, the overall cost savings range anywhere from twenty to fifty-percent. That is a figure that garners a great deal of attention. Pipe bursting does not require a large trench that destroys any and all landscaping and hardscaping in its path in order to physically reach the pipes for replacement. If the pipes are located within interior walls, floors, and or ceilings than the plumbing contractors do not need to demolish those interior surfaces. Only a small entry point is needed at each end of the pipeline. Although the traditional pipe replacement procedure can take upwards of a week or longer to complete, the entire trenchless pipe bursting process is accomplished from start to finish in as little as one full day. Another reason for its growing popularity is based on application flexibility. Pipe bursting can be used to install sewer lines, water pipes and gas pipes. Utility companies even incorporate the use of this method to put in service lines including electrical and communications ducts. In addition, there are environmental benefits. Exterior pipe bursting projects reduce excavation down to a minimum. Significantly less material needs to be removed from the site, and considerably less material for backfill and or pavement needs to be brought in. This factor causes a major reduction of fossil fuel usage and emissions from heavy-duty construction equipment. From a logistical standpoint pipe bursting cuts down on traffic re-routing, which in turn costs the project owner less money for expensive police officer details. The principal behind the pipe bursting method is to break or burst apart an existing pipe while it is still buried in the ground or interior surfaces. At the same time a brand new pipe is pulled in to replace the old one in the exact same layout. The pipe bursting procedure can be utilized for size on size pipe replacements. 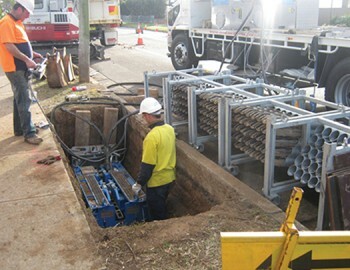 It can also be used to upgrade to a larger pipe diameter, which is a unique ability that is not available with other trenchless procedures. As you can see pipe bursting provides project owners with numerous benefits. That directly correlates to more jobs for your plumbing contracting business. As an added benefit the process is far more efficient than traditional pipe replacement. That means you will greatly reduce the amount of man-hours on each job, which will benefit your profit margins and bottom line. Getting started is easy. TRIC Tools will help you every step of the way. Our pipe bursting rentals system for plumbers in Oakland, California is second to none. You will be working with the best pipe bursting equipment, tools, and accessories available. We will set you up with everything that you need to succeed. This includes an exclusive training program and a dedicated customer service staff that is here to answer your questions. Now is the time to become involved in the trenchless revolution. TRIC Tools is your solution.